Our range of single grub screw shaft collars are a cost effective solution to positioning parts or providing a stop position on a shaft. Double split collars are suited to applications where you are unable to slide the collar on from the end of the shaft. They can be positioned in between existing items saving the time of dismantling the whole shaft. 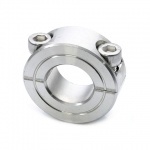 If you cannot find the type or style of shaft collar that you need please contact us here.